Southern Poland holds a couple of amazing national parks to hike and explore. Completely different from one another, and both special in their own way. In the bottom eastern corner, wedged into western Ukraine, is Bieszczady National Park. A lush green landscape sprinkled with wildflowers and crisscrossed by trails leading through beech and pine forests to gentle peaks with 360 degree views. To the west, straddling the Slovakian border are the Tatra Mountains. The highest mountains of the Carpathian range, they’re dramatic, rugged, and full of raw beauty. Mix in your motorcycle breaking down, and you got yourself a fun week. From Ukraine, I came into southeast Poland, and not far to the south is Bieszczady National Park. A Polish friend recommended I go check it out. I ended up camping for a night on a small hilltop covered in wildflowers. In this corner of the world, with no light pollution, the stars twinkle and shine bright. The sunset stretched over the entire sky, reaching its beauty out like fingers. A mystical look in the morning with the clouds tucked down into the valley and the peaks rising out of it. The “blink and you’ll miss it” village of Ustrzyki Gòrne is a good starting point with a few options for heading into Bieszczady National Park. I made the short ride south to Wołosate, and hiked in from there. First I rode through the meadows and up a ways to meet with one of the trails. Just as I was about to start hiking, a ranger showed up and kicked me out back to the main road. Crossing fields of bright spring flowers and up steep trails through the forest lead you above the tree-line. Surrounded by every shade of green, you have views to Ukraine, Slovakia, and Poland. The highest peak in the Polish Bieszczady is Mt Tarnica and atop it is a giant steel cross. If you leave early enough in the morning you can enjoy the summit with just a few other people. As the day goes on the trails get a lot more busy and a lot less peaceful. Leaving Bieszczady, I stumbled on a fox crossing the road. As we checked each-other out. a tiny fox pup came stumbling out of the brush. It hopped through the tall grass towards mama, but when I would make any noise it would dart back into the trees and peep out. Mama wasn’t too afraid, but the little one wanted nothing to do with me. Heading west, I cut down into Slovakia, and oh how nice it is to be in the EU and just ride into new countries without having to do all the passport control. The fields of Rapeseed were full of bright yellow flowers. I camped in a freshly cut field beneath the Tatras snow speckled peaks. Not a bad view out the front window in the morning. The Tatra Mountains on the Slovakian side have many roads and trails to explore. One leads up to Strbske Pleso, a beautiful glacial lake. A trail goes around the entire shore. People have been coming to the area for a long time to heal all types of ailments. Three km from the Polish border, in the village of Hladovka, my chain broke and tore up some of the teeth on the rear sprocket. Luckily I wasn’t going very fast so there wasn’t any serious damage, and I ended up in front of a house with a good family. The two brothers helped me put my bike in their garage and then drove me to the nearest city to look for parts. Being Sunday, we didn’t have any luck. They drove me all the way to Zakopane, where I had a reservation at a hostel, and wouldn’t take a dime. The next day I bused and hitch-hiked to the city with a motorcycle parts shop, and thankfully they had just what I needed. Armed with a new chain and sprocket, I mini-bused, hitch-hiked, and walked my way back to my bike in Hladovka. Pitr, one of the brothers, left work to come home and help me. When one of the parts had a problem he drove me all the way back to the shop and back. Eventually we got everything back together, I said my goodbyes, and jumped onto the seat. For the people who know me this will come as no surprise, but I forgot my keys all the way back at the hostel. Losing and mis-placing keys has been a theme of my life. Pitr didn’t hesitate to drive me all the way to Zakopane to get them. He spent half-his day, which was supposed to be at work, driving me around and giving a helping hand on the bike. When all was said and done he refused to take even gas money. It’s never fun breaking down, but it was actually all kind of a welcome break. It gets a bit boring when everything just works the way you expect it to everyday. When I stood there looking at my motorcycle on the side of the road, immediately after it broke, I wasn’t upset at all and it kind of felt good. A little bit of a wrench was thrown in and it felt like an adventure again. Forming a natural border between Slovakia and Poland, the Tatra Mountains are the highest mountain range in the Carpathians. Very similar to the Alps, but smaller, they’re one of the most beautiful places I’ve hiked in Europe. Many times I stopped on a steep edge and looked out over my surroundings totally blown away by the beauty. 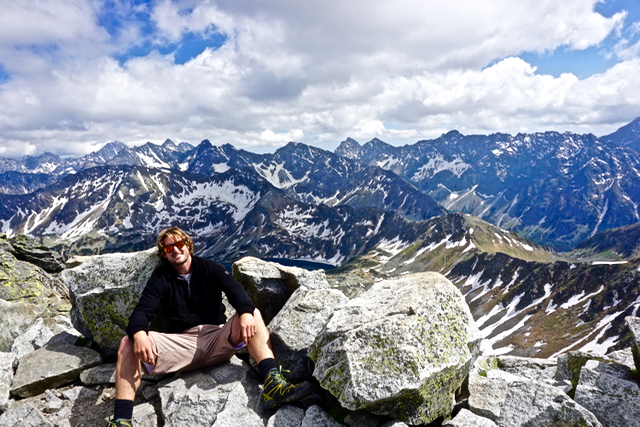 Twenty-five peaks reach up over 2,500 meters, and they’re all at your fingertips when staying in Zakopane, Poland. Once I got the bike fixed it was time to explore the mountains. I left on a two-day trek, which took me through some amazing nature. In two days you can see the best of the park and spend a night in a refuge set amongst alpine lakes. From Kuźnice, a couple of km up from Zakopane, there are many trail-heads. The green-trail leads steeply up to Kasprowy Wierch. There’s actually a ski-lift that you can pay to take up to this point, but what fun is that. Hiking quickly, you will be there in a bit over two hours, and the views get better and better with each step. The lush green landscape is traded for rough rocky grey terrain where only the hardiest of plants survive. From here the red trail ascends higher along the ridge-line. Beautiful alpine glacial lakes begin to appear below. Eventually you come face-to-face with Mt Swinica, a 2301 meter peak. It’s not the easiest climb to the top. Much of it is on sheer cliffs with drops of hundreds of meters. For the real tricky sections chains have been installed to help. I thought I was watching a girl fall to her death at one point, but she managed to hold on with one hand. There were some people up there who shouldn’t have been. Many people die each year in this area. The top is absolutely incredible. 360 degree views of awe-inspiring jagged rock. The Valley of Five lakes lies before you. It was hard to leave the top and move on. I could have stayed there daydreaming for hours. Continuing to climb along the top of the ridge brings you to Przelecz Zawrat, another steep peak. From around here a trail leads down into the Valley of Five Lakes and all the beauty it has tucked into it. Blue glacial lakes glimmer under the strong sun, surrounded by snowy peaks. Snow-melt rushes down the slopes and fills the lakes. While wandering around Wielki Staw Lake I stumbled across a young Chamoi. With summer coming, his thick winter coat was disappearing quick and leaving him looking rather ragged. The reflections of the peaks off the flat lakes is gorgeous. Right along the shore is the Dolinie Pięciu Stawów Polskich refuge. A beautiful old wooden shelter. They cook up warm meals and offer a prison-style mattress on the floor, which is all you really need after a big day hiking. For some extra money it’s possible to book a private room in advance. It’s impossible to be lonely with all the friendly Polish people packed in. The early morning in the mountains is a special time. When the sun first lights everything up it brings the most vibrant colors of the day. The lakes sit still as glass, being a mirror for all the peaks to check their faces in. From the refuge, a trail takes you up out of the valley and over towards the next one. More and more comes into view until you look down over an incredible sight. The scene of the blue glacial lakes stretched out though the valley is perfect. I couldn’t do a better job than mother nature if I tried. In the other valley lies Morskie Oko, probably the most famous lake in the area. Tourists flock to its shores. For me, Morskie Oko was nice, but the real gem is up above it. After walking along the shore to the other side a steep trail takes you up to a small lake set at the base of Mt. Rysy, which sits on the Poland-Slovakia border. This lake, tucked between steep rock faces, has crystal clear tropical water. Amazing reflections and an amazing way to end a two-day trek. This entry was posted in adventure travel, Motorcycle world travel, Photography, poland travel, slovakia travel and tagged alpine lakes, best hike, Bieszczady, morskie oko, national park, poland, slovakia, strbske pleso, tarnica, tatra mountains, travel, trekking, valley five lakes, where to go. Bookmark the permalink. Ryan, Poland looks like one of the most beautiful places of your travels. Jaw dropping beauty!